TomTom GO LIVE 820 car sat nav provides street-level navigation via a 4.3-inch touchscreen display. What's more you can enter your destination by simply announcing the address, thanks to the built-in speech recognition technology. The GO 820 is also a LIVE product enabling TomTom LIVE services like traffic, speed cameras and weather information as you drive! Two versions of the TomTom GO 820 with different preloaded maps are available, these are UK/Ireland and Europe maps. TomTom GO LIVE 820 has been discontinued. 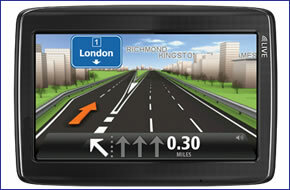 TomTom GO LIVE 820 V2 Europe/UK and Ireland is the top-of-the-range in-car sat nav from TomTom. It has a 4.3-inch basic touch screen screen and the unit uses Bluetooth technology to make and receive hands-free calls. The GO LIVE 820 is available with two different map versions. The 820 Europe includes road maps for 45 European Countries and the GO LIVE 820 UK and Ireland includes maps of UK and Ireland. Plus its QuickGPSfix makes the locating of satellites very quick. TomTom GO LIVE 820 includes one year FREE TomTom LIVE Services which offers the ability to drive LIVE across more than 30+ European countries**. This operates over the GSM network providing you with the latest speed camera locations, traffic information, weather forecasts, access to Twitter and trip advisor/expedia accessibility. In addition, TomTom HD Traffic provides traffic information to your TomTom 820 and it provides alternative route proposals. **Services may vary. Subsequent subscription charges apply, currently (April 2013) 1 year subscription is £47.50. You can also download daily map changes so you always know which roads are closed and changes in speed limits, etc. Furthermore Eco Routes technology ensures the satellite navigation system always calculates the most fuel-efficient route and thus reduces your impact on the environment. This TomTom system speaks street names and voice recognition technology enables you to input where you'd like to go to and make hands-free calls via the units Bluetooth. GO LIVE 820 also provides birds eye view of alternative routes and advanced lane guidance provides 3D images picturing each junction. It will even locate points of interest with the feature TomTom Places. These include petrol stations and supermarkets. TomTom GO 820 is a LIVE*** connected sat nav and as such receives real-time fixed and mobile speed camera locations and live reports from other users. TomTom get's it speed camera data from Road Angel a leading UK speed camera detector manufacturer. The GO LIVE 820 sat nav also alerts you when you’re speeding, even if you're not in navigation mode. ***TomTom LIVE service subscription required - 1 year included FREE. Subsequent yearly subscription is currently £47.50 (price correct as of 23rd April 2013). ‣street-level road maps - TGL820 - UK and Ireland maps, TGL820E - Europe maps. TomTom GO LIVE 820 has been designed to be a plug and play device, and as such can be transferred from vehicle to vehicle with ease by the user. A unique magnetic dock makes docking and undocking your the GO 820 sat nav easy. TomTom GO LIVE 1005 sat nav is available either preloaded with European maps (45 countries) or with World maps including USA, Canada,Australia, Southern Africa and South East Asia. Detailed map coverage: Andorra, Austria, Belgium, Czech Republic, Denmark, Estonia, Finland, France, Germany, Gibraltar, Greece, Hungary, Italy, Liechtenstein, Lithuania, Luxembourg, Malta, Monaco, Norway, Poland, Portugal, Republic of Ireland, San Marino, Slovakia, Slovenia, Spain, Sweden, Switzerland, the Netherlands, United Kingdom and Vatican City. Do you have a question about the TomTom GO LIVE 820? Submit your question via our contact page.